Libre Mexican Cantina has opened at the Red Rock Casino, Resort & Spa in the former space of Mercadito. The colorful décor designed by Alessandro Munge of Munge Studios features cartoon-like caricatures of Mexican freestyle wrestling lucha libre; lime green upholstered booths, archways and tiles; and wood tabletops. The menu designed by Clique Hospitality partner Brian Massie includes items such as short rib molcajate, queso fundido, carne asada skirt steak and brown rice bowls with choice of chicken, mahi mahi, carne asada or tofu. The menu also includes a prominent vegan selection and several gluten-free items including grilled portobello taco, coconut ceviche and chili rellenos. Complementing the cuisine are signature cocktails, a collection of more than 50 tequilas and dessert options including tres leche with lemon curd and cinnamon churro ice cream sandwich. A daily happy hour from 4 to 6 p.m offers drinks and menu items for $6. Libre Mexican Cantina, Red Rock Casino, Resort & Spa, 11011 W. Charleston Blvd., Las Vegas, NV 89135, 702-478-5118. The Southern California-based PizzaRev has opened its first location in Southern Nevada at Sunset Road and Stephanie Street in Henderson. The craft-your-own pizza concept allows guests to choose their own sauce, cheese, proteins and veggies, with unlimited toppings priced at $7.99 for an 11-inch pie. There are also vegan cheese and gluten-free dough options. After staff assembles the pizza in an assembly line-like process, the pizza is cooked in in a 900-degree oven in three minutes. Also offered are craft-your-own salads, cookies, dessert pizza and craft beer and wine. PizzaRev is open daily for lunch and dinner. PizzaRev, 1381 W. Sunset Rd.#100, Henderson, NV 89014, 702-776-7171. DB Brasserie at The Venetian is launching a bi-monthly seasonal tasting menu. The four-course menu will be featured for a week and will center around one or two seasonal selections. The first tasting, A Celebration of Duck and Truffles, will run from Feb. 22 until Feb. 28 beginning at 5 p.m. nightly. The menu will include marble of foie gras au torchon and perigord truffles with petite greens, duck prosciutto and walnut vinaigrette; double duck consommé with soft root vegetables, black trumpet mushrooms and shaved truffles; pithivier of duck confit and seared Hudson Valley foie gras with sunchokes mousseline and black truffles condiment; Moulard duck a l’orange with Belgium endives, salardaise potatoes and triple sec gastrique; and gateau Basque with Armagnac cherries crème glacée. The cost is $99 plus tax and gratuity. DB Brasserie, The Venetian, 3355 Las Vegas Blvd. S., Las Vegas, NV 89109, 702-430-1235. 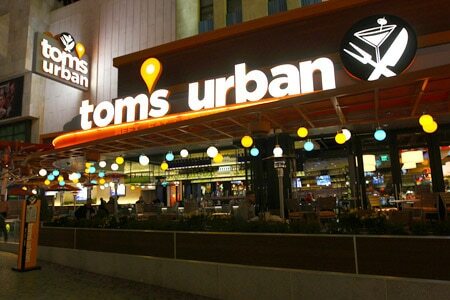 Tom’s Urban at New York-New York has launched a unique Beat the Clock happy hour running Monday through Friday, beginning at 4 p.m., with food and drink prices rising every hour until 7 p.m. It also takes place late night Sunday through Thursday, beginning at 11 p.m., with prices dropping every hour until 2 a.m. Among a dozen small plates are ginger chicken potstickers, crispy Brussels spouts, fried dill pickles and street tacos; drink specials include select signature cocktails, well drinks and all draft beers. Tom's Urban, New York-New York Hotel & Casino, 3790 Las Vegas Blvd. S., Las Vegas, NV 89109, 702-740-6766. The tropical-themed Kahunaville Island Restaurant & Party Bar at Treasure Island has closed. The venue known for its flair bar, frozen margaritas and Island Heat show opened in August 2001. Treasure Island has plans to demolish the 17,562-square-foot space, but a replacement for the space has not yet been announced. Kahunaville, Treasure Island, 3300 Las Vegas Blvd. S., Las Vegas, NV 89109, no phone.